Few words carry as much weight for workforce management (WFM) professionals as forecasting. Nothing else has the power to simultaneously elevate and torpedo the customer and employee experience quite like a forecast. _Eighty-three percent of buyers expect to be immediately routed_to the agent who is most knowledgeable about their issue, making an accurate forecast critical to successful customer experience strategies. It’s also one of the hardest jobs in the contact center. Here’s why: Understaffing can leave agents feeling frantic and rushed, adding anxiety to an already stressful role. It also subjects customers to extended wait times, resulting in lost revenue and brand loyalty. Throw in unexpected events such as a website outage, and agents are left scrambling to answer an influx of calls. Alternatively, overstaffing can lead to bloated costs for calls that never come—and turn a contact center into a cost center. An accurate forecast not only keeps budgets in line, it also allows agents and customers to benefit from a better experience. Agents can do their jobs and build long-term relationships, and customers can quickly and easily get the help they need. Forecasting is getting more complex. As the number of communication channels jumps from nine to 11 this year alone, contact center managers are challenged to ensure that their department is properly staffed at all times. And it’s not just about having bodies in seats; it’s having the right people with the right channel skills at the right time. Given that 72% of businesses say that the customer experience is the top priority, a proper forecast should also be at the top of that list. To stay ahead of increasing communication channels and sky-high customer expectations, contact center managers must rethink traditional forecasting methods. Typically, contact centers use three metrics to forecast staffing needs: contact/call volume, handle time and daily contact arrival pattern. These methods are intended to benchmark spikes in volume in order to predict future staffing needs. Contact/call volume measures how closely the forecasted number of customer interactions match the actual number of interactions that agents handle every day. Handle time is the average duration of one transaction. Daily contact arrival pattern refers to the times of day where the contact center is the most and least busy. While these metrics are a great start and they do provide valuable insights, they’re also missing certain critical elements and context. Without that context, contact center managers can’t hone their forecasting skills and deliver accurate results. As customer expectations continue to grow, accuracy is paramount, and managers must look beyond traditional metrics. For the contact center, it’s no longer just about call volume; it’s about having the right team available at the right time on the channels where customers need the most direct support. To do so, contact centers everywhere are implementing new technology solutions that capture massive amounts of data, allowing managers to track phone, web chat, email and social metrics quicker than ever before. However, that data must be viewed alongside historical data and through the lens of experts. On top of the influx of customer data, one of the biggest game-changers in forecasting is how customers interact with businesses. Customers are communicating with companies using social, email, web chat, phone and more—and all of those interactions require resources. It’s no longer just phone calls that require agents’ time and effort—all types of interactions must be taken into account and incorporated into forecasting strategies. Utilizing historical data, contact center managers can identify trends in customer support needs, and use those insights in conjunction with a forecasting analyst’s knowledge of the contact center’s business drivers and marketing objectives. Then, by layering in multichannel analytics, managers can see if the contact center is performing as expected and make appropriate adjustments along the way. The influx of data and analytics isn’t necessarily changing contact center metrics; rather these new insights are adding deeper context to the numbers. For example, data from the prior year may show spikes around a certain time, which gives managers a baseline idea of seasonal needs. While some of those spikes may be obvious—for example, a retail company sees a dramatic increase in interactions from October to December around the holiday season—others are not. With the right mix of analytics and forecasting metrics, analysts can create a clearer picture of performance and can make informed decisions. If call volume is trending up, with the help of speech analytics they can determine why customers are calling, enabling them to make the smaller adjustments along the way that can save labor costs while giving customers the service they need. In addition, by looking at activities such as current marketing campaigns, product launches or promotions, managers can understand how actions outside of the department are impacting agents in the contact center. These new tools are giving contact center managers additional visibility, allowing them to use concrete data and insights to better hone their forecasts and net more accurate results. As accuracy increases, so will customer satisfaction, which will build customer loyalty and fuel toppling growth. In order to improve forecasting accuracy, contact center managers must build the right foundations, rethink current metrics and deploy the right technology. First, a business must define what forecasting accuracy means—and that will be different for every contact center. Contact centers expect to see variances in the forecast to actual, but there’s always a breaking point. Therefore, goals should be based on staffing tolerance and the point at which the increase in work will lead to higher abandons, higher occupancy, and less satisfied agents and customers. 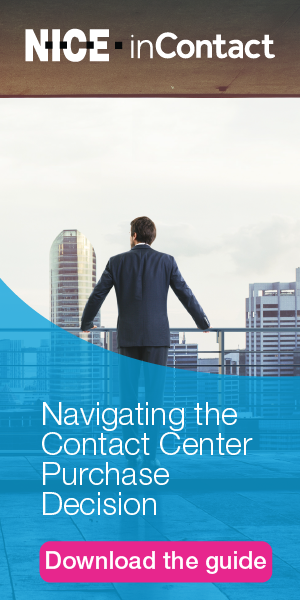 While it is typical for agents to have periods of higher occupancy, each contact center is unique, so how long that can be sustained will vary. Second, contact center managers must view metrics through a new lens. Improving accuracy is not just about having the right metrics, it’s about applying the right mix of analytics and historical data to those metrics to gain a clear understanding of what’s going on in the contact center—and then forecast accordingly. Here’s a new look at the traditional metrics and how contact center managers can add the right context to increase forecasting accuracy. How many calls the contact center receives is a critical piece of the forecasting puzzle. But it’s not the only piece. That data should not be used to simply look ahead; it should also be used to see how closely forecasted interactions match the actual number of contacts. Not only that, managers must look at interactions taking place across channels and understand the “why” behind the call. By looking at individual and aggregate data, managers can understand what customers want and change up staffing schedules appropriately. With this complete view, managers will be able to make adjustments to achieve greater accuracy. How long contact center agents need to resolve an inquiry—the handle time metric—will give managers an idea of agent availability to answer new requests. However, resolving a customer’s issue often requires multiple interactions, and those interactions can take place over phone, email or web chat. Call handle time shouldn’t be based on the first transaction alone, but the entire series of subsequent interactions that are related to the same case. Daily contact arrival pattern is also known as forecast accuracy by interval. This metric shows patterns on the busiest and slowest times of day. It allows managers to determine the number of agents needed to manage daily peaks and valleys. By looking at historical patterns and applying trending data across all channels, managers will be able to account for schedule inflexibility to manage the busiest times. Third, it’s important to have the right tools and technology in place that allow contact centers to invest in the agents who are on the front lines. Agents can make or break the customer experience, and if managers are forecasting accurately, it will prevent agent burnout while ensuring that customer needs are met, every time. Not only that, forecasting can be incredibly time-consuming, and one of the biggest improvements in new workforce optimization tools is the ability to significantly automate forecasting and have clear visibility into contact center data across channels. The ability to identify trends and make changes is what allows managers to ensure that the right agents are available in the right channels when customers need them most. In addition, advanced workforce management technology can now build precise forecasts in minutes, streamlining workflows and reducing overstaffing, all of which leads to more satisfied and engaged employees and frees up a manager’s time to develop employees. For the contact center, forecasting is incredibly important. Not only does an accurate forecast keep budgets in line, the customer experience and employee morale hinge on it. With the number of customer communication channels increasing all the time, it’s the contact center’s responsibility to have the right agents available at the right time to meet customers wherever they are. As more and more data becomes available within the contact center, it’s up to managers to lay the right foundation to set the department up for success. By using this influx of information in conjunction with the right tools and expertise, managers can add context to metrics and take the burden out of forecasting. As the time investment goes down and accuracy goes up, contact center agents will be able to focus on building long-lasting relationships with customers that increase brand loyalty and drive toppling growth.